John Carmello is a native of Albany and graduate of Albany High School. He received bachelors and masters degrees from the University at Albany and earned SAS and SDA administrative certifications in 2002. Mr. Carmello has been in the field of education for nearly 30 years. He taught mathematics and coached basketball for 10 years in South Colonie School District. 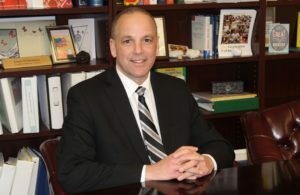 In July 2001, he began his administrative career as Dean of Students, followed by Associate Principal in both the middle school and high school levels at Colonie. In 2005, Mr. Carmello came to the Troy City School District as Troy High School’s House Principal; then Building Principal in January 2006. After six enjoyable years as THS Principal, Mr. Carmello was appointed to the position of Assistant Superintendent of Curriculum and Instruction in July 2011. Mr. Carmello began his tenure as Superintendent of Schools in July 2013. Mr. Carmello is happily married to his wife, Amy. They have three sons: Corey, Justin, and Ryan. Classroom Concerns: If there is a concern about an issue in the classroom, parents/guardians are encouraged to meet with the teacher first. Communication at this level often resolves the matter. Building Concerns: If there is a concern about general school operations and policies, or if meeting with a teacher is either inappropriate or does not resolve the concern, parents/guardians are encouraged to meet with the building Principal or Assistant Principal.